ECC | Richard M. Hicks Consulting, Inc. When deploying Windows 10 Always On VPN, many administrators choose the Internet Key Exchange version 2 (IKEv2) protocol to provide the highest level of security and protection for remote connections. However, many do not realize the default security parameters for IKEv2 negotiated between a Windows Server running the Routing and Remote Access Service (RRAS) and a Windows 10 VPN client are far less than ideal from a security perspective. Additional configuration on both the server and the client will be required to ensure adequate security and protection for IKEv2 VPN connections. In their default configuration, a Windows 10 client connecting to a Windows Server running RRAS will negotiate an IKEv2 VPN connection using the following IPsec security parameters. This information can be obtained by opening an elevated PowerShell command window and running the following command. This can also be confirmed by viewing a network trace as shown here. 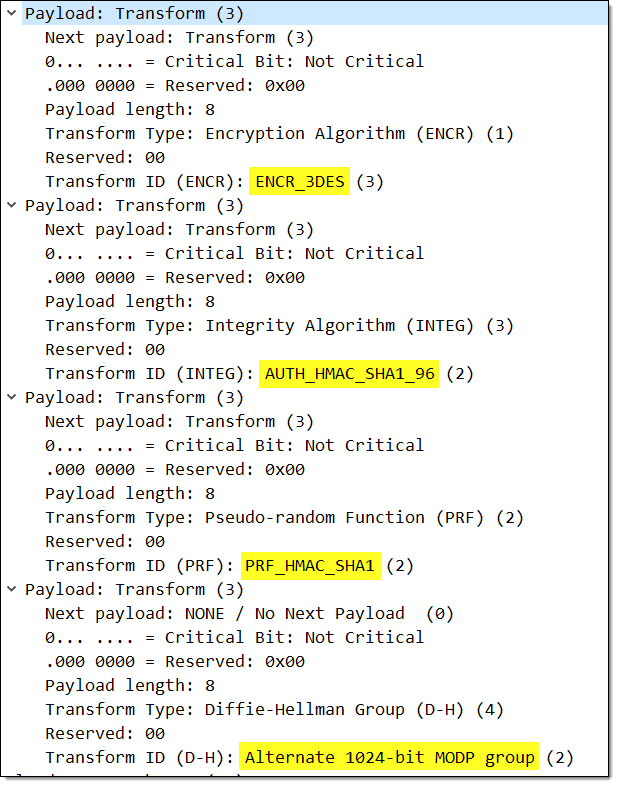 To provide a baseline level of protection to meet today’s requirements for security and privacy for IKEv2 VPN connections, the following are the minimum recommended IPsec security parameters. To implement these recommended security baselines for IKEv2 on a Windows Server running RRAS it will be necessary to define a custom IPsec security policy. To do this, open an elevated PowerShell command window and run the following commands on each RRAS server. 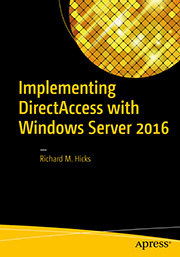 Restart the Remote Access Management service for the changes to take effect. The IPsec policy must match on both the server and the client for an IKEv2 VPN connection to be successful. Unfortunately, none of the IKEv2 IPsec security association parameters proposed by default on Windows 10 clients use 2048-bit keys (DH Group 14), so it will be necessary to define a custom IPsec security policy on the client to match the settings configured on the server. 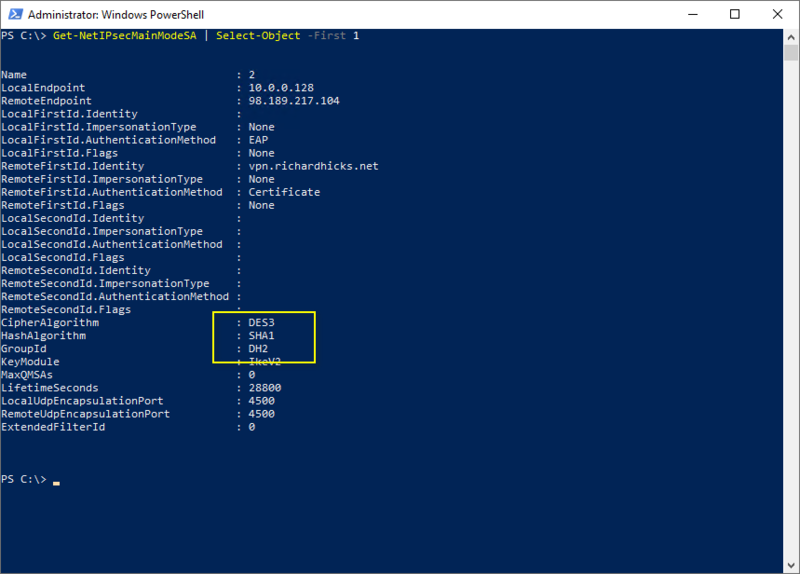 To configure a matching IPsec security policy on an individual Windows 10 VPN client, open an elevated PowerShell command window and run the following command. In the process of testing it may be necessary to restore the default IKEv2 configuration on both the client and the server. This can be accomplished by running the following PowerShell commands. To implement a custom IPsec policy using the minimum recommended security settings for an Always On VPN connection using IKEv2, add the following settings to your ProfileXML. In the examples above you’ll notice that I’ve chosen to use AES128 and not AES256. This is by design, as AES256 does not provide any practical additional security in most use cases. Details here. To further improve security and performance for IKEv2, consider implementing Elliptic Curve Cryptography (EC) certificates and using Galois Counter Mode (GCM) cipher suites such as GCMAES128 for authentication and encryption. As I’ve discussed previously, it is strongly recommended that the TLS certificate used for SSTP be signed using the Elliptic Curve Digital Signature Algorithm (ECDSA). ECDSA provides better security and performance compared to RSA certificates for Windows 10 Always On VPN connections using SSTP. See my previous post Always On VPN SSL Certificate Requirements for SSTP for more information. 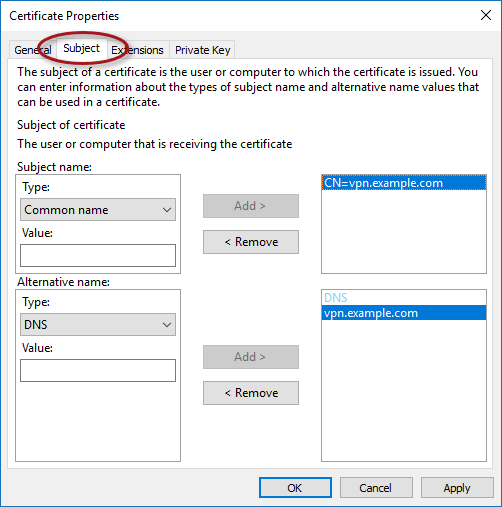 To generate a Certificate Signing Request (CSR) using ECDSA to send to a public Certification Authority (CA), open the local computer certificate store (certlm.msc) on any Windows server or client and follow the steps below. Expand Certificates – Local Computer. Right-click the Personal folder and choose All Tasks > Advanced Operations > Create Custom Request. 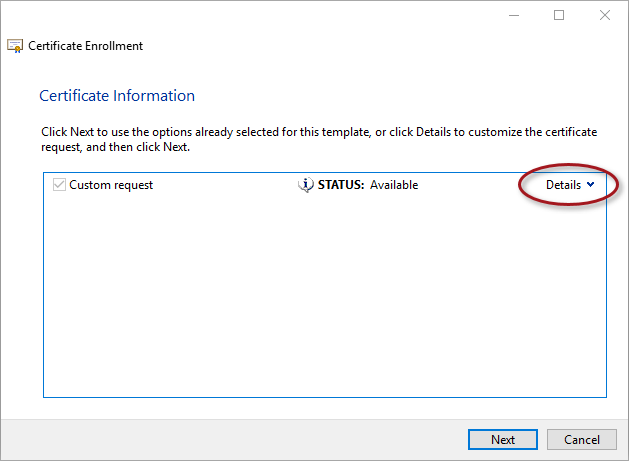 Select Proceed without enrollment policy. From the Template drop-down list choose (No template) CNG key. On the General tab enter a name in the Friendly name field. Click on the Subject tab. In the Subject name section, from the Type drop-down list choose Common name. 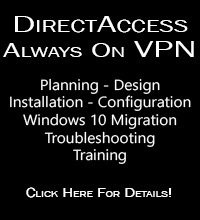 In the Value field enter the VPN server’s public hostname and click Add. In the Alternative name section, from the Type drop-down list choose DNS. Expand Extended Key Usage (application policies). Click on the Private Key tab. Uncheck RSA,Microsoft Software Key Storage Provider. Check ECDSA_P256,Microsoft Software Key Storage Provider. Select the option to Make private key exportable. Enter a name for the file in the File Name field. Once complete, submit the CSR for signing to your favorite public CA. Based on my experience, some CAs are easier to obtain ECDSA-signed certificates than other. Today, Digicert seems to be one of the better public CAs for obtaining EC TLS certificates. Once the CA has issued the certificate, import the certificate in to the local computer certificate store on the same client or server where the original CSR was created. The certificate can then be exported and imported on additional VPN servers, if required. The Windows Server 2016 Routing and Remote Access Service (RRAS) is commonly deployed as a VPN server for Windows 10 Always On VPN deployments. Using RRAS, Always On VPN administrators can take advantage of Microsoft’s proprietary Secure Socket Tunneling Protocol (SSTP) VPN protocol. SSTP is a Transport Layer Security (TLS) based VPN protocol that uses HTTPS over the standard TCP port 443 to encapsulate and encrypt communication between the Always On VPN client and the RRAS VPN server. SSTP is a firewall-friendly protocol that ensures ubiquitous remote network connectivity. Although IKEv2 is the protocol of choice when the highest level of security is required for VPN connections, SSTP can still provide very good security when implementation best practices are followed. Since SSTP uses HTTPS for transport, a common SSL certificate must be installed in the Local Computer/Personal/Certificates store on the RRAS VPN server. The certificate must include the Server Authentication Enhanced Key Usage (EKU) at a minimum. Often SSL certificates include both the Server Authentication and Client Authentication EKUs, but the Client Authentication EKU is not strictly required. The subject name on the certificate, or at least one of the Subject Alternative Name entries, must match the public hostname used by VPN clients to connect to the VPN server. Multi-SAN (sometimes referred to as UC certificates) and wildcard certificates are supported. It is recommended that the SSL certificate used for SSTP be issued by a public Certification Authority (CA). Public CAs typically have their Certificate Revocation Lists (CRLs) hosted on robust, highly available infrastructure. This reduces the chance of failed VPN connection attempts caused by the CRL being offline or unreachable. Using an SSL certificate issued by an internal, private CA is supported if the CRL for the internal PKI is publicly available. RSA is the most common key type used for SSL certificates. However, Elliptic Curve Cryptography (ECC) keys offer better security and performance, so it is recommended that the SSTP SSL certificate be created using an ECC key instead. 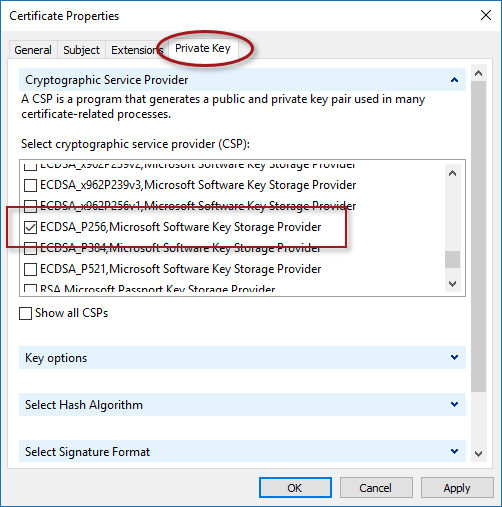 To use an ECC key, be sure to specify the use of a Cryptographic Next Generation (CNG) key and select the ECDSA_P256 Microsoft Software Key Storage Provider (CSP) (or greater) when creating the Certificate Signing Request (CSR) for the SSTP SSL certificate. Forward secrecy (sometimes referred to as perfect forward secrecy, or PFS) ensures that session keys can’t be compromised even if the server’s private key is compromised. 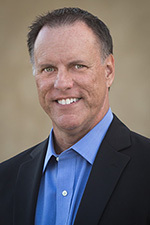 Using forward secrecy for SSTP is crucial to ensuring the highest levels of security for VPN connections. To enforce the use of forward secrecy, the TLS configuration on the VPN server should be prioritized to prefer cipher suites with Elliptic Curve Diffie-Hellman Ephemeral (ECDHE) key exchange. Authenticated encryption (AE) and authenticated encryption with associated data (AEAD) is a form of encryption that provides better data protection and integrity compared to older block or stream ciphers such as CBC or RC4. To enforce the use of authenticated encryption, the TLS configuration on the VPN server should be prioritized to prefer cipher suites that support Galois/Counter Mode (GCM) block ciphers. Important Note: In Windows Server 2016, GCM ciphers can be used with both RSA and ECC certificates. However, in Windows Server 2012 R2 GCM ciphers can only be used when an ECC certificate is used. Offloading SSL to a load balancer or application delivery controller (ADC) can be enabled to improve scalability and performance for SSTP VPN connections. I will cover SSL offload for SSTP in detail in a future post. SSTP can provide good security for VPN connections when implementation and security best practices are followed. For optimum security, use an SSL certificate with an EC key and optimize the TLS configuration to use forward secrecy and authenticated cipher suites.